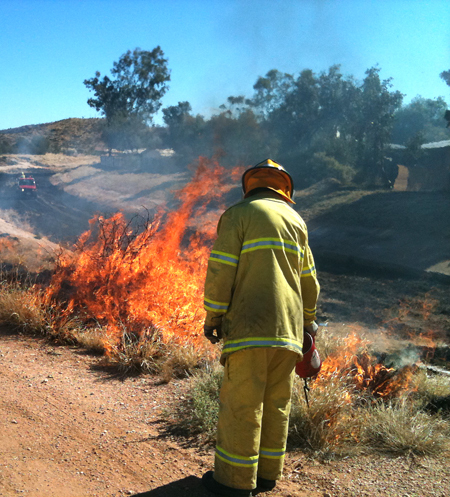 Senior Station Fire Officer in Alice Springs, John Kleeman, says he would welcome the assistance of prisoners in reducing the fire fuel load south of the Gap, as is being pushed for by the Town Council. Aldermen passed a motion last night to write to the Department of Lands and Planning “regarding engagement of Correctional Services” to help with this task “south of Heavitree Gap to the Municipal Boundary, incorporating the river and parklands”. Mr Kleeman says the fire service has been doing control burns in the area – including around Amoonguna “where a lot of people have been throwing matches” – and are continuing to do so today, as well as north of Emily Gap. He says government contractors have also done a major slashing job along the river from John Blakeman Bridge to Colonel Rose Drive. The “trusties” (prisoners) could help to do more slashing, especially in areas where it’s hard to get front-end loaders in to clear firebreaks. While with slashing the fuel remains on the ground, having the grasses lie flat reduces the intensity of a fire that may go through. Mr Kleeman says the town has been lucky so far to not lose property or life, but the situation could go “pear-shaped” at any time. He encourages the public to prepare their properties and report to police anyone acting suspiciously with fire.